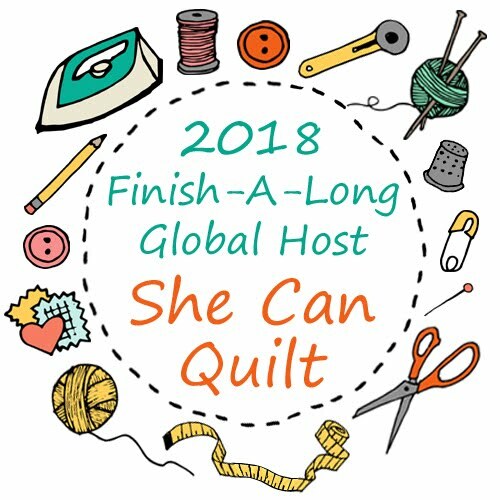 she can quilt: Pivot - Ta Da! 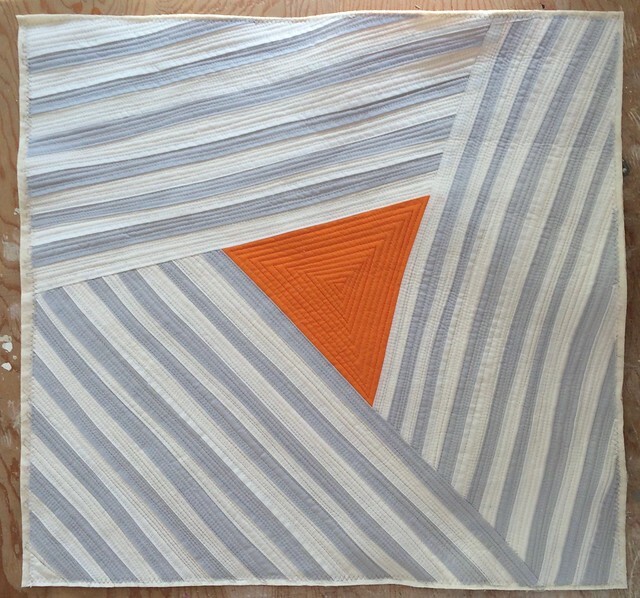 I finally named this little quilt Pivot. She is 20" square. 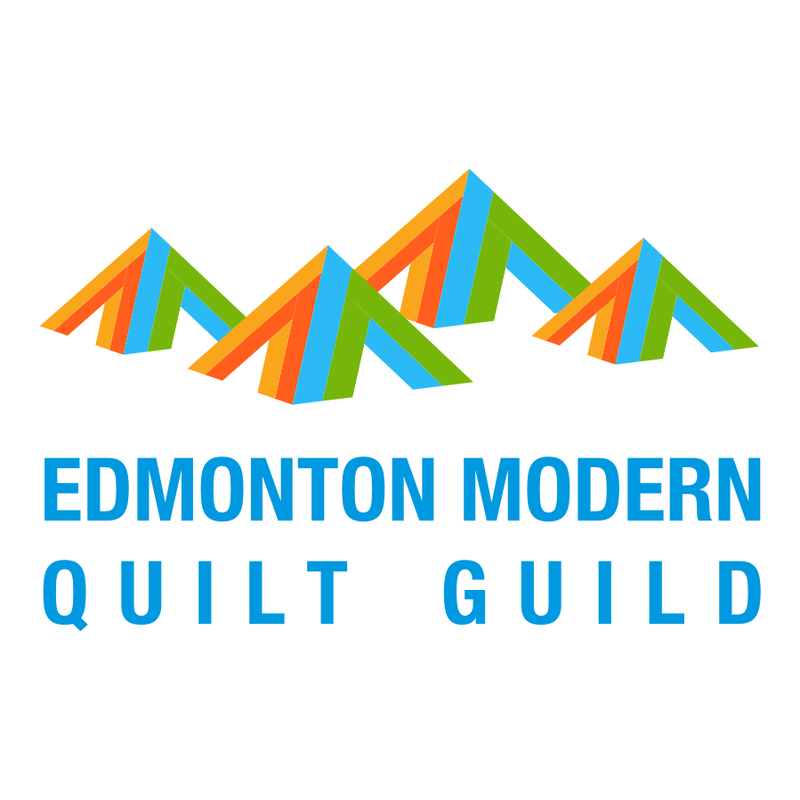 I made her for the Lethbridge Modern Quilt Guild modern mini quilt paint chip challenge. 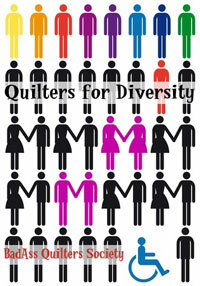 We are hoping that maybe we can hang our quilts together in public somewhere soon. Once I find my paint chips again I will come back and add a photo here of them. They are grey, creamy white and orange. Of course, I left this project to the last minute. Our guild meets on first Tuesday night of the month. So I started on Monday night. Luckily I had thought a lot about what I wanted to make so I was able to get right to work. I had made a block very similar to this for Stephanie in Bee Sewcial and I took this opportunity to make a similar one. Next time I will try for about 60' square. This pieces for the top were cut without a ruler. I did keep my ruler nearby to help me stay straight-ish rather than veering off to the side too much. Each of the fabrics I used were left overs - scraps I guess - and I did not have any extra, so I wanted to avoid too many totally unusable cuts. I have to say that I am in love with the combination of thin not straight lines and the creamy white and light grey to make the. I admit to choosing my paint chips with this plan in mind. I started quilting Pivot that same night but it was late and I was tired. I used a variegated orange Star thread for the triangle and a variegated grey Aurifil thread for the stripes. 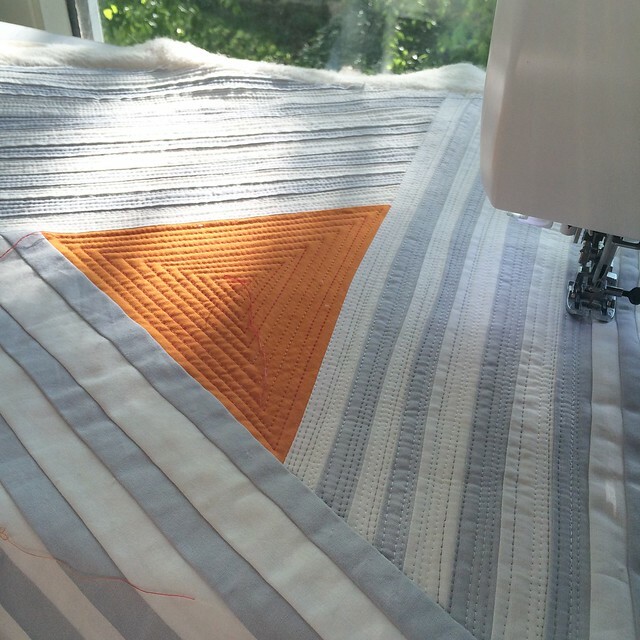 The quilting is dense not straight lines, unevenly spaced. 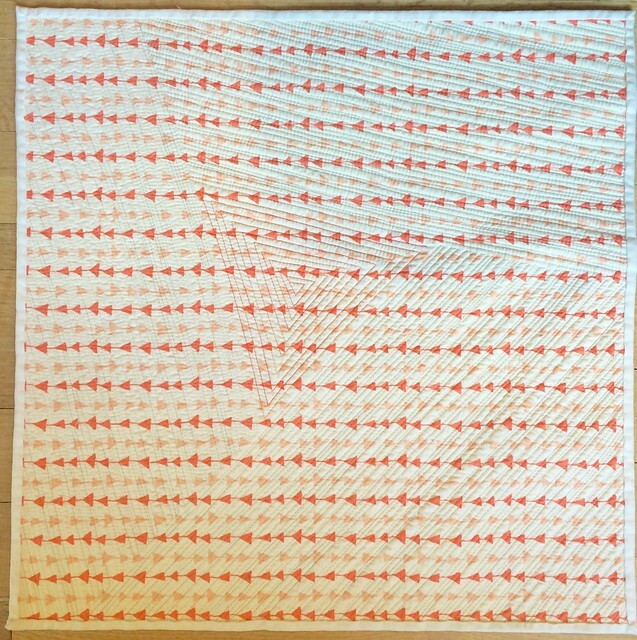 I used my domestic machine because, perhaps surprisingly, it is very challenging to quilt lines on the diagonal on the long arm and easy to do on the domestic. I got up early and quilted before work and took a couple of coffee breaks and finished the quilting at lunch. My guild is hoping to hang these quilts in a show and I knew I wanted to wash the quilt for the added texture that would add. So the quilt was larger than 20" - by about 3" on each side. Also since I knew I was not going to have time to wash it after it was bound and still take it to the guild meeting, so I washed it before I bound it. I trimmed off the extra backing and batting and zig zag stitched the edges before throwing the quilt in the washer and dryer. Luckily I was working from home that day. I'm not sure everyone knows how mini quilts come out of the washer and dryer so I took this photo. I then steamed her flat. I did not press the iron down much as I steamed the quilt as I wanted to keep the texture. I let the quilt rest for a bit and then I trimmed it to 20" square. I added a white binding to match the stripes. I did not want the binding to steal the show and if I had had more time I might have used a faced binding instead. Here is the back which is a fabric that I thought complimented the quilt nicely. I used a single fold binding (tutorial here) and hand stitched her after work. I shared all these photos except the top one on instagram as I went. Pivot was finished in time for my guild meeting, the last binding stitch went in 30 minutes before I had to leave. I am going to share her about the internet, I really love this little quilt. I am linking up with Amanda Jean at Crazy Mom Quilts for Finish It up Friday. I've also linked up at Fabric Tuesday. 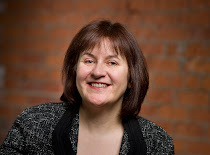 Always love your work Leanne and this is no exception! Fabulous! It's lovely, I wish I could reach through the screen and feel the texture! It looks wonderful.....a favourite colour combo of mine!!! Your quilt speaks to me . . . And the procrastination! Aside from a great design, the texture really adds interest to your mini quilt. I'm inspired. Great design and the quilting not only accentuates it, but gives it a 'ghost' feel on the back. Beautiful execution of what must have been much creative musing. What a lovely finish. The texture makes you want to touch it. Great colour combination. Really beautiful and I can soooo relate to its title! I've loved following your progress on IG too - thanks! That is one amazing little quilt! Love this little one, esp. 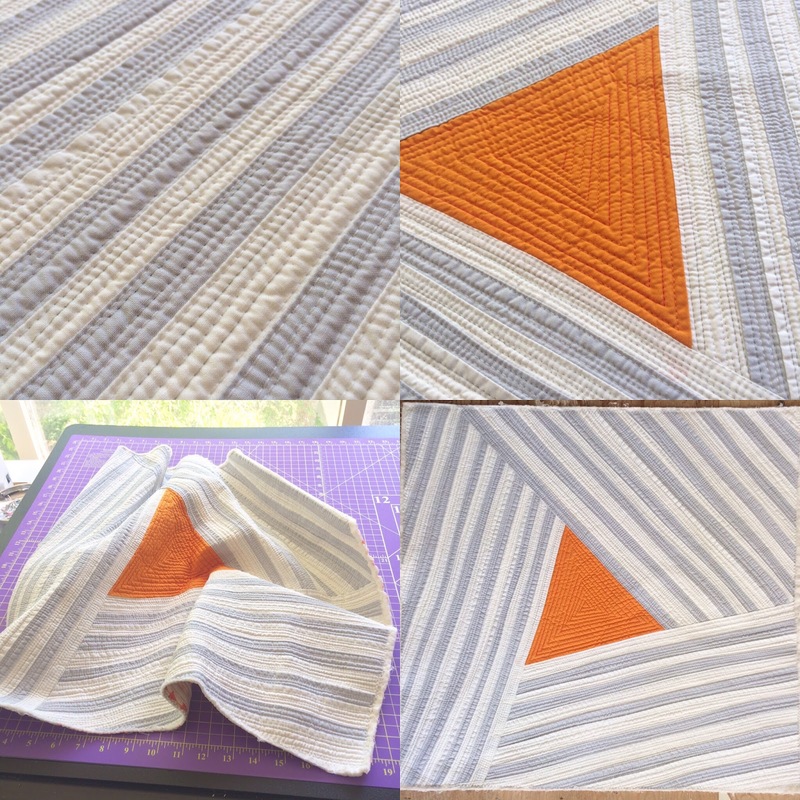 The not quite straight lines and that quilting! 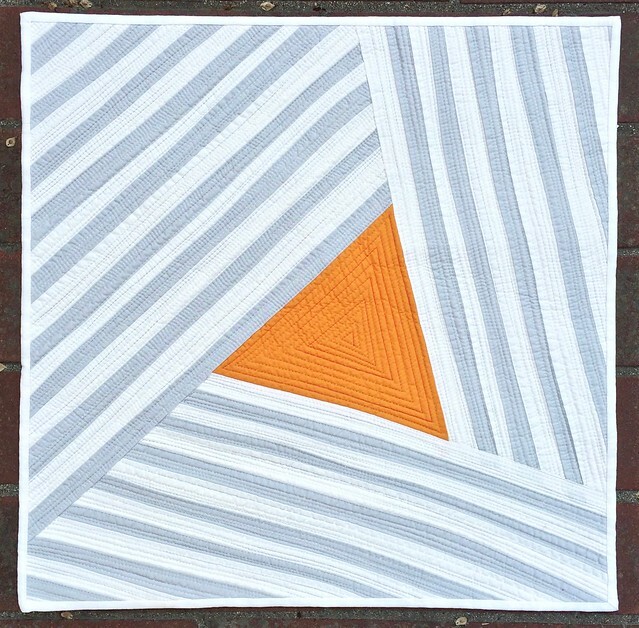 Just out of curiosity: did you quilt the triangle inside - out or outside - in? Love it Leanne! The colors make me think of dreamsicle ice cream - yum! The design is totally visual, and your matchstick quilting complements it perfectly. That texture is craaaazy good! Another beauty! The texture gets me every time! I'm in awe of what you have done. It's absolutely stunning. I do have a question. Do you really plan for your next one to be 60' square? WOW! I don't know how you would get that done on a domestic machine. I love this! 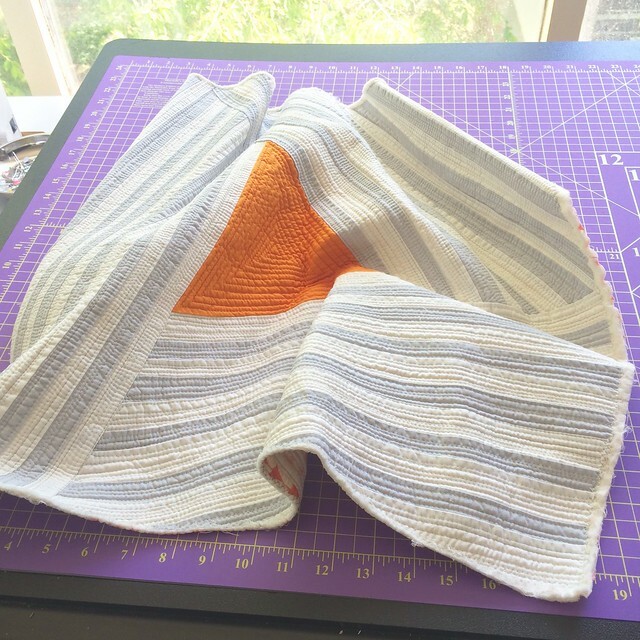 Did you make the striped fabric and add it as one piece? Tryin to figure out the process. Love Pivot! It's very interesting and the strips really look like one striped fabric. A closer look, though, and it's awesome to see that you pieced it. 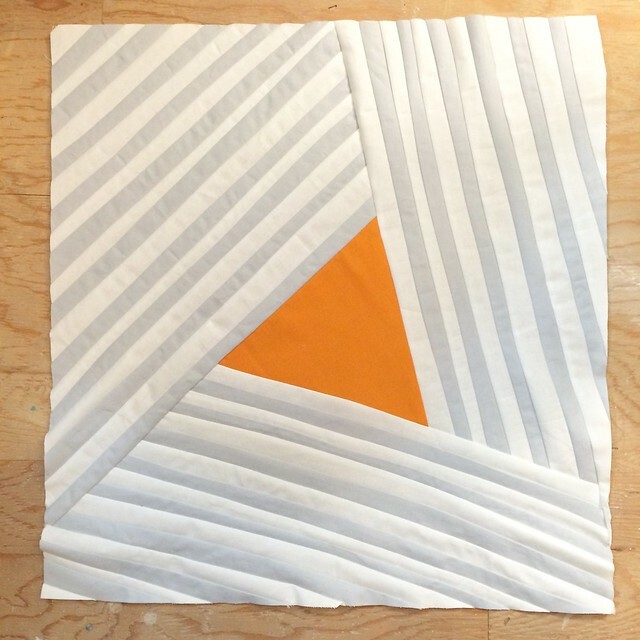 The quilting in your orange triangle really does the trick for adding movement and boldness. I find angles are tough on the long-arm, too. Invariably that's when I'll get a wobble! Now I wonder what other long-armers do about that. She definitely fits with the style of your other work, fresh and vibrant with a clear idea! Leanne, what a beauty. Of course I'm partial to Orange. Love that it's totally of scraps. Thanks for the "after wash" share too...the texture really makes it cool. Beautiful! Interesting that you added the binding after washing and squaring up. It's fantastic Leanne!!! Great use of the three colors you were given. I like the white binding and the fabric for the backing too. Hope your guild finds a nice location to showcase them all. It's beautiful - the colours are perfect together and it looks so tactile. Beautiful finish! I love how the colors and design are highlighted and enhanced by the quilting. You do like a bit of "just in time management" Leanne! It is a beauty of course! Scraptastic Tuesday - the May link is open!